Leo Vegas is currently the UKs fasted growing online casino. A vigorous advertising campaign running alongside some great bonuses and promotions have made this a big favourite within a year of it's full launch. Leo Vegas have a friendly site that is easy to navigate. the casino games are all readily available within 2 or 3 clicks. And there are so many to choose from. Games from NetEntertainment, and Microgaming and many others gve this a good all round coverage and variety to keep all casino players happy. When you first get to Leo Vegas casino you will need to create your casino account. This is free and simple and should only take you a couple of minutes. Once set up you are ready to try all the games as a fun player. There is also a great inventive to register for FREE, you are given 20 FREE REGISTRATION SPINS. This is basically a no deposit bonus which gives you 20 FREE SPINS to use on a big favourite slot game - BOOK OF DEAD. When you have used your 20 free spins you should be ready to make your first deposit. This is also simple to do and a really good place to start to get a 100% cash match, double your money bonus. Deposit anything from £10 to £100 to give up to £100 FREE CASH. You will also get another 20 BONUS SPINS. In addition to the 100% cash bonus on your first deposit you will get a further 100% cash match bonus on each of your next 3 deposits. With each deposit claim £100 and 20 BONUS SPINS. This gives a total £400 cash bonus and 100 free BONUS SPINS. This is a great welcome bonus. The bonuses and promotions at Leo Vegas keep on growing as you play. Every week there are new competions and points races with fabulous prizes. Every week at Leo Vegas there is a competition or point race. This can win you some fabulous prizes of Holidays to Las Vegas, Technology equipment like Ipads and TV's, or even just give you prizes of FREE SPINS or BONUS CASH. Either way there is loads to do and loads to win. 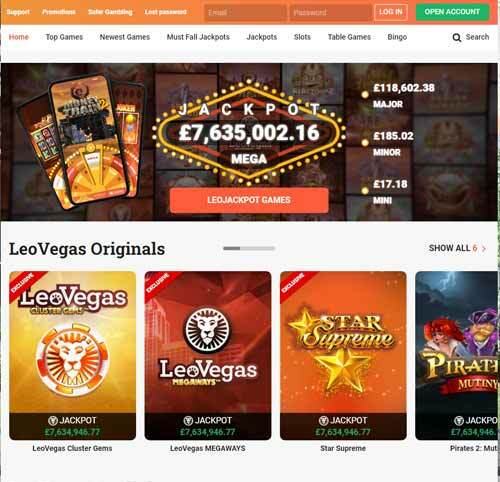 Leo Vegas is open to players all over Europe including the UK and Ireland. The casino is fully regulated and licenced, with safe and secure banking options. Make deposits and play in GBP, EUR, USD, CAD and many other languages and currencies. Withdrawal of winnings is fast and free, direct to an eWallet such as PayPal, Neteller or Skrill.